Ruth Alsop, 82, a member of Local 802 since 1952, died on Jan. 23. Her husband of 49 years, Keith Lamar Alsop, 85, died just over a week later, on Feb. 3. He had been a Local 802 member since 1953. Ms. Alsop played cello for over 50 years with the New York City Ballet Orchestra, where her husband was the concertmaster. 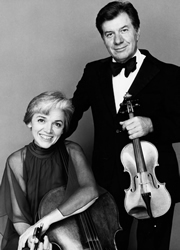 She also performed with her husband in the Alsop-Bernstein Trio. Ms. Alsop played at Radio City Music Hall, taught music at Brooklyn College and SUNY (Potsdam), and toured with the Gotham Trio. When the Statue of Liberty was renovated and rededicated in 1986, Ms. Alsop played with Frank Sinatra at the ceremonies. Ms. Alsop held a master’s degree in music from Manhattanville College of the Sacred Heart and also studied at the Yale School of Music. Her husband began his career at 17 in the Utah Symphony Orchestra, under conductor Maurice Abravenal. Mr. Alsop mastered the violin, viola, clarinet, flute and saxophone before completing his musical studies at Columbia University. He was a member of the Beaux Arts String Quartet, the American String Quartet, the Carnegie String Quartet and the Philadelphia Piano Quartet with Philadelphia Orchestra concertmaster Norman Carol. Mr. Alsop taught at Brooklyn College, SUNY Potsdam and Luzerne Music Center. In addition to his career in symphonic music, he toured the country with Fred Waring and the Pennsylvanians. Mr. Alsop was one of the most well-recorded studio artists of his generation. He collaborated and recorded with Aretha Franklin, Frank Sinatra, Michael Jackson, Diana Ross, Roberta Flack, Nina Simone, Tony Bennett, Carly Simon, Bette Midler, Barbra Streisand, Peter Paul and Mary, Ricky Martin, Wynton Marsalis, Gloria Estefan, Spyro Gyra and many others. He can be heard on the soundtracks of over 50 movies, including “Fargo” and “Fame.” Among his avocations was the art of whistling, and he was featured on numerous albums and commercials as whistler. The Alsops are survived by their daughter Marin (who is also a member of Local 802), Marin’s partner Kristin, and grandson Auden. In addition, Ruth Alsop is survived by her sisters M. Elaine Love, Clair Meuse and Nancy Green. A memorial service to honor the Alsops will take place later this year. Tax deductible donations can be made to the Alsop Family Foundation at P.O. Box 70185, Springfield, OR 97475. Richard “Richy” A. Barz, 74, died on Dec. 25, 2013. A graduate of the Crane School of Music at SUNY Potsdam, Mr. Barz served in the U.S. Army Field Band until his honorable discharge in 1964. 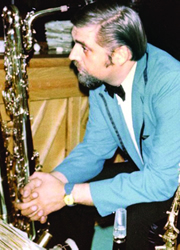 An accomplished musician, he began his professional big band career with the Les and Larry Elgart Orchestra. He was the road manager and woodwind player with the Glenn Miller Orchestra for many years, traveling the world 50 weeks a year and recording numerous albums. Mr. Barz also contracted musicians and played in many other famous big bands. After a long career on the road he settled down in Rye, N.Y., and became a booking agent for the prestigious Willard Alexander Agency. He represented jazz and big band artists. Mr. Barz recently produced, directed, played and contracted on three Glenn Miller Orchestra Christmas albums, which each sold over one million copies. His journey ended with a move to the Poconos in 1986, where he and his wife, Nancy, opened their own company, Big Band Productions, producing, directing and marketing top-name big band shows at various resorts in the area. Most recently, Mr. Barz was a woodwind instructor. He dearly loved teaching his craft to others. He is survived by his wife Nancy, daughter Lisa, son-in-law Chris, grandson Cody, sister Barbara, niece Michele and nephews Robert and Michael. Richard Hayman, 93, the conductor and arranger, died on Feb. 5. He had been a Local 802 member since 1953. Mr. Hayman was best known as the chief arranger and guest conductor for the Boston Pops for over 50 years, where his arrangements are still used today. He also served as the conductor of pops concerts in St. Louis and led other pops orchestras around the country. Mr. Hayman started out as a harmonica player and arranger for Borrah Minnevitch and His Harmonica Rascals before moving to Hollywood and becoming an arranger for Metro-Goldwyn-Mayer studios. He also served as musical director for the Vaughn Monroe Orchestra and worked for Mercury Records. 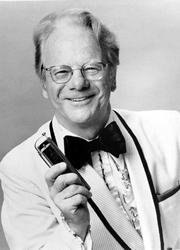 Along the way, Mr. Hayman kept up his harmonica profile, including a 1953 hit “Ruby,” which sparked a renewed public interest in the harmonica. Another hit, “Dansero,” became an international favorite, as well as his rendition of “Night Train.” His 1957 album “Havana In Hi-Fi” was the first in the Mercury label’s pop music stereo LP series. Mr. Hayman’s last event with the St. Louis Symphony Orchestra, where he held the title of pops conductor emeritus, took place on June 27, 2010, to honor his 90th birthday. The St. Louis Metro Singers, who performed with him at many Pops concerts, were also on stage at the event. Mr. Hayman is survived by his wife Maryellen, daughters Suzy and Olivia, and four grandchildren. Jerome Jolles, a virtuoso accordionist and a member of Local 802 since 1953, died on Jan. 9. Mr. Jolles was a native of Romania. Upon arriving in the U.S., he was immediately invited to be part of a band in the Catskills. Mr. Jolles soon formed his own club date band, working in the Catskills while continuing his education at Juilliard in the field of composition. In 1961, he decided to devote himself to composition and teaching. Nonetheless, he continued to perform and record both classical and popular music. Mr. Jolles was beloved by his students, several of whom are members of Local 802. Jerome is survived by his wife Susan, daughters Renee and Annette, and five grandchildren. An interview with Mr. Jolles’ wife Susan, who is also a member of Local 802, appears in this issue. 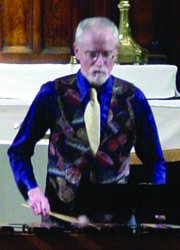 James Preiss, 72, a percussionist and a member of Local 802 since 1968, died on Jan. 21. Mr. Preiss studied at Eastman under William Street before winning a chair in the U.S. Marine Band (“The President’s Own”), where he had the honor of playing snare during President Kennedy’s funeral procession. After leaving the Marine Band, Mr. Preiss earned a master’s degree at the Manhattan School of Music, studying with Morris “Arnie” Lang and Fred D. Hinger. Mr. Preiss was a founding member of Steve Reich & Musicians (1971) and Parnassus. He was principal percussionist of the Brooklyn Philharmonic, the American Composers Orchestra and the Westchester Philharmonic, and performed with nearly every professional orchestra in New York. Mr. Preiss performed and recorded with the Chamber Music Society of Lincoln Center, the New Music Consort and numerous others. Mr. Preiss taught at Mannes and also the Manhattan School of Music, where he formed the Manhattan Marimba Quartet, the first professional marimba quartet in the world. Mr. Preiss himself played bass marimba in the group for 20 years. After retiring from teaching, Mr. Preiss founded a commissioning project for solo marimba works. Among the composers who wrote works dedicated to him were Dan Levitan, Davide Zannoni and Eva Weiner. He was an inspiration to many generations of students, composers, and colleagues. Mr. Preiss is survived by his sons Jeffrey and Christopher. This obituary edited from a longer version written by Bill Trigg (BillTrigg@gmail.com). Early on, Mr. Seeger performed with Woody Guthrie as part of the Almanac Singers. Later, as a member of the popular folk group the Weavers, Mr. Seeger was blacklisted during the McCarthy era. He proudly defied the House Un-American Activities Committee, risking jail time. After helping to found the Newport Folk Festival in 1959, Mr. Seeger re-emerged on the public scene as a prominent singer of protest music in support of international disarmament, civil rights and environmental causes. In 1969, he helped found Clearwater, an environmental organization that also operates two sailing vessels on the Hudson River. Up until his death, he was actively leading songs and attending rallies. In 2011, Local 802 honored Mr. Seeger at the union’s 90th birthday gala. That same year, Mr. Seeger marched in the street as part of the Occupy Wall Street protests. 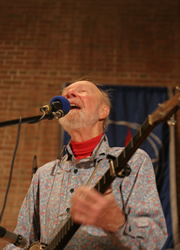 Mr. Seeger won three Grammys during his career, as well as the country’s highest arts honor, the National Medal of Arts. He is survived by his son Daniel, daughters Mika and Tinya, half-sisters Peggy and Barbara, eight grandchildren and four great-grandchildren. Mr. Seeger’s life and career were far too rich to condense into this short space. Please see our additional tributes by John O’Connor and Dave Elsila in this issue. Background information from the New York Times and Wikipedia.